Games have an unhappy relationship with the water. The ocean might ripple and sparkle with superficial beauty, but beneath the surface there’s only fog designed for outdoor weather systems. If it doesn’t kill you on contact, it’ll do it slowly as you struggle to save a stiff swimmer from their own control scheme. Looking to explore a different frontier? Here are the best space games on the PC. Abzu doesn’t tell you not to touch the lava. Abzu says: come on in, the water’s lovely. For one thing, its ocean is bright and colourful, painted in soft blues and greens by Journey art director Matt Nava and his team. For another, it’s a game that celebrates underwater swimming’s illusion of weightlessness. As a wetsuited and flipper-footed diver, you can pitch at any angle, twisting and flipping fully upside down. 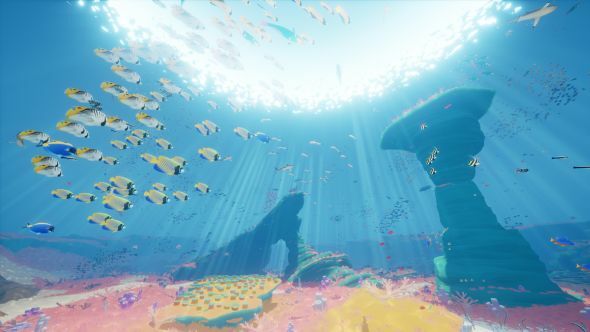 It’s hard to express how unusual that freedom of movement is until you feel it for yourself; swimming in Abzu is akin to hopping and skipping through Mario 64’s castle. As you propel yourself through the water, shoals of little yellow fish fall in behind you, shifting in and out of orbit like iron filings around a magnet. Abzu studio Giant Squid have developed simulations for shoaling behaviour, as well as a food chain dominated by bigger predators you can cling to and steer. Even the kelp forests, dense collections of tall, brushlike seaweed, are beholden to unseen algorithms. There are kelp forests and fish just like these off the coast of southern California, near Santa Monica where Giant Squid are based. Abzu’s story is told without words. Early on, your diver recovers an underwater drone from the sea bed, which blinks into animated life and drifts along at your flank. Later, as you pass through the mouth of a cave, a shark enters stage right and grabs that drone out of the water, shaking it this way and that like a dog with a toy. 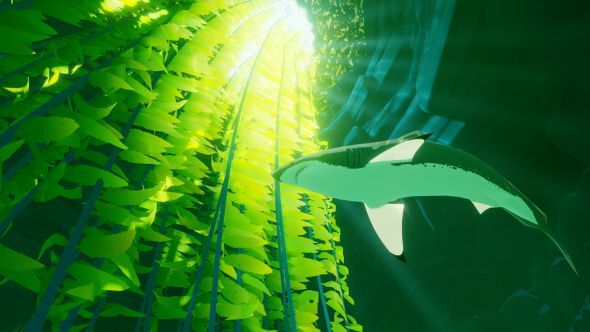 Abzu’s sonorous score is composed by fellow Journey alumnus Austin Wintory, who worked closely with Giant Squid sound designer Steve Green to create an “audio narrative” that works in conjunction with the visual tale the studio are telling. 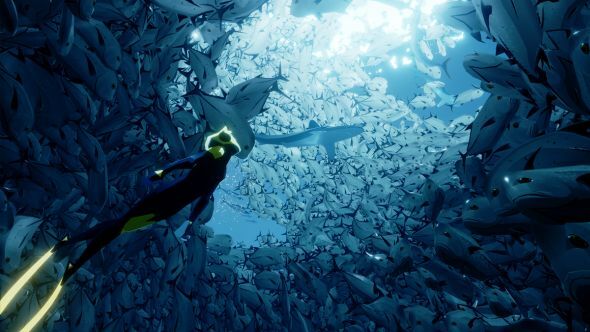 The precise nature of Abzu’s plot remains a mystery, at least until its release tomorrow. But it revolves somehow around decaying architecture – the fishbowl furniture that decorates its environments. Through these ancient Persian-style arches and gazebos, you travel via portals into a spirit world where you can exchange a little of your own essence to bring life back to deserted areas of the ocean. In surreal scenes, a blue liquid fills up this dead sea and it’s rejuvenated, newly stuffed with kelp and creatures. But even at its weirdest, Abzu is inspired by real phenomena. Thanks to changing cell concentration and temperature, divers have observed lakes of liquids denser than water. As reference, Giant Squid dug out an image of scuba divers with fishing rods submerged in one of these second seas. The studio have worked in Unreal Engine 4, and access to its source code has allowed Cornish to develop unique systems for underwater illumination. It’s paid off. As you drift between shafts of light, piggybacking manatees through the kelp, it’s hard not to share the studio’s wonder for the world beneath the waves. Abzu is out on PC on August 2. Unreal Engine 4 development is now free. In this sponsored series, we’re looking at how game developers are taking advantage of Unreal Engine 4 to create a new generation of PC games. With thanks to Epic Games and Giant Squid.